Home / Blog / Animal Protection Act Amendment Passes the National Assembly Standing Committee. On February 23, News 1 in Korea reported that the amendment to the Animal Protection Act, which includes strengthening the punishment for animal abuse to a 2-year prison term, has passed the Standing Committee of the National Assembly. This is a great victory for the animal rights activists in Korea and abroad who have been campaigning on behalf of Korean animals for many years. While this does not end the dog and cat meat trade, which is what we desperately want, it’s definitely proof that the Korean government is starting to feel the heat. It’s both a step in the right direction and encouragement for us to work that much harder. So let’s keep up our campaign to bring an end to the dog and cat meat trade! Possibly as early as March of next year, puppy mills will have to be licensed and punishment for animal cruelty will carry a prison sentence of up to 2 years or a fine of 20 million won. At its general meeting on February 23rd, the National Assembly’s Agriculture, Forestry and Livestock Food and Fisheries Committee passed the amendment of the Animal Protection Act for the prevention of animal abandonment and abuse that includes these conditions. The amendment, passed by the standing committee, will be presented to the legislative and judiciary committee and then brought to the plenary session on March 2. If it passes the plenary session, the law will go into effect one year later. 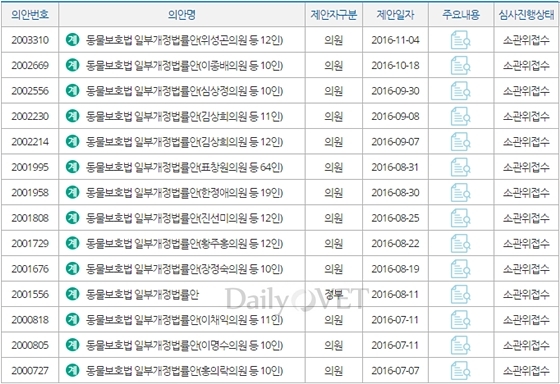 Under current law, animal abuse is punishable by imprisonment for up to one year or a fine of up to 10 million won. However, if the amendment is passed, punishment is reinforced by “imprisonment of up to 2 years or fine of up to 20 million won.” To address the puppy mill issue, which caused a social outcry for changes in the animal production industry, the current notification system will be converted to a licensing system. The amendment also provides punishment for dog fighting by including within the definition of animal cruelty the act of using animals for gambling or the lending of animals for profit. The amendment additionally provides for the federal government to subsidize the establishment and operation by local governments of animal protection centers. However, despite the urging of both the National Assembly animal welfare forum and animal rights groups, the government objected to the inclusion in the amendment the strengthening of standards for breeding and management; companion animal production registration; urgent seizure or forfeiture measures for abused animals and ownership restrictions of abusers; and restrictions on the transportation and sale of companion animals. Proposed amendment to the Animal Law introduced in 2016. Source: Dailyvet. Click HERE to learn about the Proposed Animal Protection Law. Click HERE for news report from Dailyvet in Korean. [Update March 2, 2017] Amended Animal Protection Act passes. oh how good it is to hear it !!! a little step but how much expected !!! I see that the korean citizens start to wake up !!! next step : ban this horrible torture and consumption of dogs and cats !!! korean people : you are able to do more !!! the whole world is looking at you !!!! OMG!! Such terrible cruelty!! How do you people sleep at night, knowing you torture animals??!! They sleep at night ‘cos they have no conscience & I don’t believe they will ever change!! They are the scum of the earth! How I wish the same & much worse is inflicted upon them!! May they rot in hell !! Much of the world feels this way-there is no depth to the lack of conscience. This is a huge step!!! I’m so happy to hear this. Now to ban the consumption of companion animals. Awful people on this Earth, poor animals that come to their hands ..
It’s it is about time. Humans must be more respectful of humans and animals or our world will only continue to get worse and that is hard to imagine. Humans today are cruel,sadistic, inhumane and disgusting in the way that treat living breathing creatures be it human or animal and this must be addressed and changed now!! We have been working so hard to try to stop this insanity of extreme cruelty and horrifically painful slaughter of dogs and cats. I’m so glad that we are beginning to see changes made but we must CONTINUE TO WORK HARDER TO STOP ANIMAL ABUSE.TORTURE,SLAUGHTER AND THE CONSUMPTION OF CATS AND DOGS ASAP. ESTO ES UNA GRANDIOSA NOTICIA, PORQUE SÓLO LA IGUALDAD ENTRE LOS SERES HUMANOS Y LOS ANIMALES PROMUEVE LA FORMACIÓN DE LEYES DETERMINANTES QUE SALVAGUARDEN ESTA IGUALDAD, CON ELLO, CONFORME PASE EL TIEMPO, ESTAS LEYES SON APOYADAS POR MILLONES DE PERSONAS EN EL MUNDO COMPLETO Y DAMOS UN GRAN PASO EN EL ESTABLECIMIENTO Y VIGILANCIA DEL COMPORTAMIENTO Y TRATO ÉTICO HACIA LOS ANIMALES; CONSERVANDO LA LIBERTAD, LA PAZ Y LA JUSTICIA ENTRE TODOS LOS SERES VIVOS. Stop the brutal torture, and horrific inhumane way you treat your animals! You are a disgrace to Humanity and a heartless, shameless group of people !!! You are animal abusers of the worst kind!!! We must not thank them, but show them in every possible way that this is no way near enough, this is NOTHING compared to what really a civilized nation should do. This is a piece of good news, badly needed. However, the heinous savagery of your dog and cat eating has not been addressed. Why? Are you determined to remain a backward country still living in the middle ages? You are despised and hated for this. Move forward, this is 2017. Have you actually watched some of the many videos showing exactly what is going on in your country? I suggest you do and see for yourself. Many of these dogs are domesticated pets, stolen and slaughtered. Please, stop this horrific business. The civilised world will look on you with favour. A big step in the right direction, well done for all your efforts. 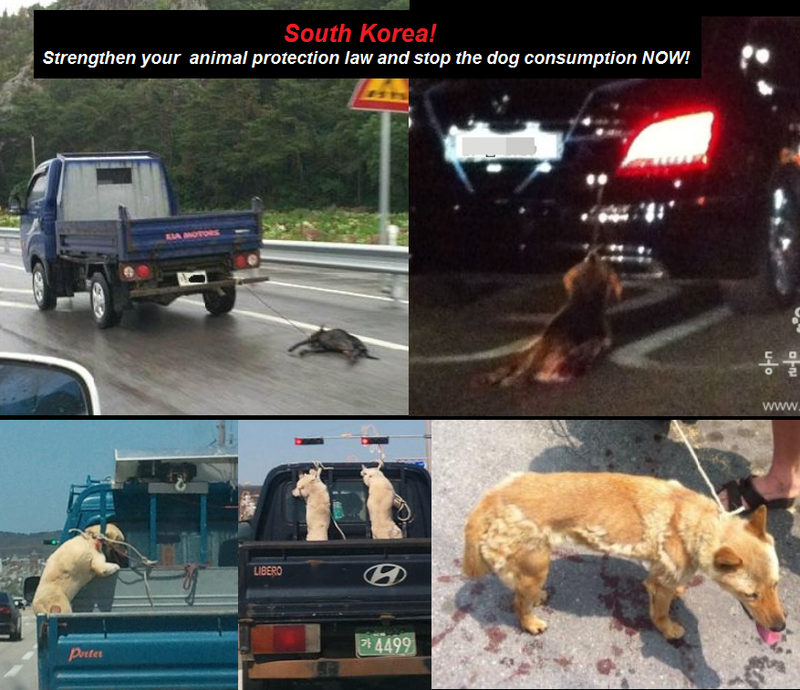 Slowly but surely you are pushing attitudes in S. Korea in the right direction. There’s a special place in hell for the people of Korea! Stealing ones pet and torturing them prior to death. May these people have the same retrebution coming to them a thousand times stronger. Korea, China, Philippines, Thailand, Bangladesh, India, Vietnam, Malaysia, and surprisingly Switzerland also the out lying Asian countries this message is for you also. You disgraced the world with your in humane antics with companion animals. And now the Olympics going to Korea I’m boycotting that, the IOC should’ve done more to help and rescue these animals and try to cap the horrendous torture and treatment. Hey I’m for an eye for an eye, the Korean should be tortured and put to death as well. If any country gets the scumbag award it’s Korea, second China. These countries should be boycotted from tour, games, and much more.